Yesterday, we pulled up our traps and only got 4 shrimp and 3 large female crabs, which we can’t keep. Bummer! We ate the last of our crab for lunch today. We all had such a good time those Cohos out at Cape Edgecombe that we sailed North to Salisbury Sound and tried our luck off of Cape Georgiana. No luck today. We wanted to catch Sergius Narrows before the currents got crazy and got through shortly after noon. We just drifted in the entrance of Peril Straight while we ate our home made clam chowder (we didn’t catch enough clams so we added halibut) and then headed South through Peril Straight. I hate the scary names of these passages. Why don’t they name it Serenity Straight instead? Right at the junction of Peril Straight and Chatham Straight we saw a ton of fishing boats so we decided to try our luck amongst them. Sure enough, we caught salmon. Within about an hour, we had seven! They were all pretty small and they didn’t look quite the same as the ones we caught yesterday. I found out today they were Pink Salmon, shucks! Some people don’t like them and others say that they’re great but I think all would agree that they’re not as good as King, Coho, or Sockeye. I love smoking my own salmon so we may have to smoke the Pinks. We still had a great time catching them, though. 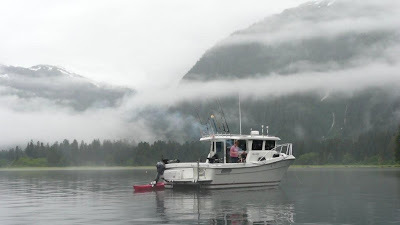 We picked up a beautiful anchorage in Ell Cove, almost directly West of Sitka; although we had to go all the way back around Baranof Island to get here. The topography is getting much more rugged and we’re starting to see more snow again. The seas were flat and everyone had a nice time. Val made the most amazing meal of the trip. We had King Salmon stuffed with a few asparagus stalks and topped with crab, bacon and Asiago cheese. Everyone rated it a solid 10! I hope the Pink Salmon taste this good but I doubt it. Today, we had a light cruising day. 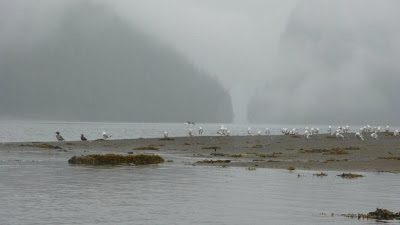 From Ell Cove, we headed South down Chatham Straight for Baranof Warm Springs. They have a public float there we got the last dock amongst all the commercial fishing boats. 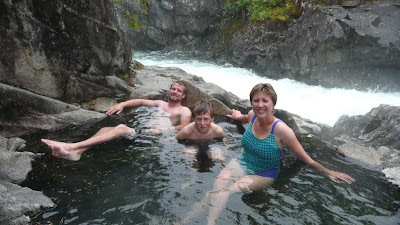 We hiked up to the natural hot springs and relaxed in the hot pools alongside a massive waterfall. It was so pretty and so relaxing. It was foggy and rainy and it felt great to soak in the hot tub and enjoy the sound of the rushing water and the rain. After our crab and “leftovers” lunch at the dock, we cruised about another hour down to Red Bluff Bay. It was really foggy and we ran on radar most of the way. Red Bluff is an amazing bay. It reminds me of Yellowstone and also of Ford’s Terror. We set our hook on the first try at the head of the bay beside a waterfall and a river. 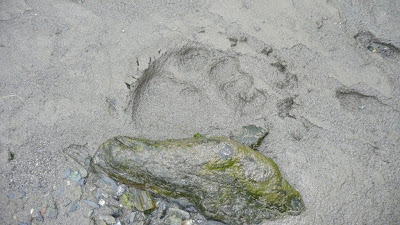 While we were getting settled Connor spotted a grizzly bear and her two cubs on the tide flats. He jumped in the dinghy to check them out while I launched the kayak to paddle up the river to see what I could catch. The river was rushing to fast and I couldn’t make any headway against the current. By the time I got back to the boat, the boys had the shrimp and crab pots down and were finished with the dinghy so I thought I’d try powering up the creek. The tide was out and the current proved too much for the dinghy. More rocks on the prop! Ouch! I drifted into the shallows and waded up the stream pulling the dinghy. I finally beached it and walked as far as I could before giving up. My goal was to make it back to the lake and try for some Cutthroat Trout. There were fresh bear tracks everywhere! As I walked back to my dinghy, I could see salmon running up stream so I started casting. What do you know? I caught two nice salmon but, again, I wasn’t sure what kind they were and I didn’t know if they were any good if they were spawning. 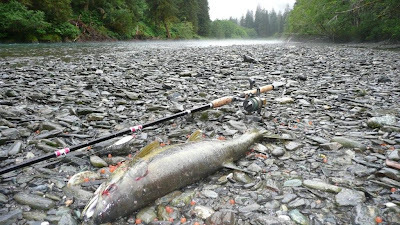 That was so much fun; standing in the creek with my boots on, in the rain, casting for those salmon. When they hit, they fought hard jumping out of the water, flipping around, and running downstream. What an adrenaline rush. So, back to the boat to check the book and butcher them to see if they were any good. Darn it! We found out they were Chum Salmon. I think they rate about like the Pinks. The meat looked good so we vacuumed them up and stuck them in the cooler. I hope we don’t end up with a bunch of yucky fish. I really want to get into the Kings, Cohos, and Sockeyes! The boys were playing cards. Val was cooking cheeseburgers and buffalo wings for dinner followed up with oven-baked chocolate chip cookies for dessert. Val is feeding us oh so good. Once again, the scenery here is amazing. I wish you could be here too. Well, it’s 9PM. Time for devos and poker. Have a great night! Sunday, July 19, Cyrus Cove, Fun In The Sun!